within a 4 mile radius! 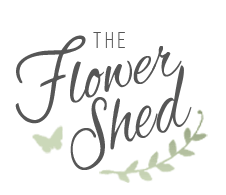 The Flower Shed (formally Design for Flowers) offers everything you could want from a Gloucestershire florist. We use the best quality flowers and have the knowledge, experience and imagination to help guide those looking for a little inspiration. Our store is open 6 days a week and floral arrangements can be ordered over the telephone or by visiting the store (visit our contact page for in store opening times). Arrangements can be collected (during our opening hours) or we can deliver. Simply ask us for more details. We just wanted to get in touch to say thank you for the beautiful flowers you arranged for our wedding at Elmore Court two weeks ago. They were just WOW! The venue flowers and bouquets were all stunning and they enhanced Elmore Court perfectly. You were super generous with the flowers and foliage too so thank you. All our guests commented how beautiful the flowers were. We handed the flowers out to our friends and family the following day and two weeks on they are still looking amazing! Our flowers were simple, creative and beautiful! I cannot let your fulfillment of the order for flowers that I made last Saturday pass without thanking you from the bottom of my heart that you superbly supplied to the Hilton Puckrup Hall Hotel. They were so gorgeous and made my wife's Birthday a very special affair. Thank you very much. I love it when I have a delivery from the team at The Flower Shed, they have wonderfully fresh flowers and are talented florists, and can do either modern or traditional arrangements for all price ranges and all occasions. It is such a joy when you know what you are thinking, and they can produce exactly what you were hoping for!